Mike was happy with the power above for about a month before he decided to make an appt and up the ante. His wife and neighbors were unhappy with how loud the car had become so we offered to buy back his exhaust and give him an an option with our proven boost activated cutouts. When showing him the product and explaining the function, he agreed to give it a shot. Halfway thru the day, Mike decided to go from the HTA Green to a 6466 kit we had on the shelf. Few hours later we mount the requested goods and get back on the dyno. 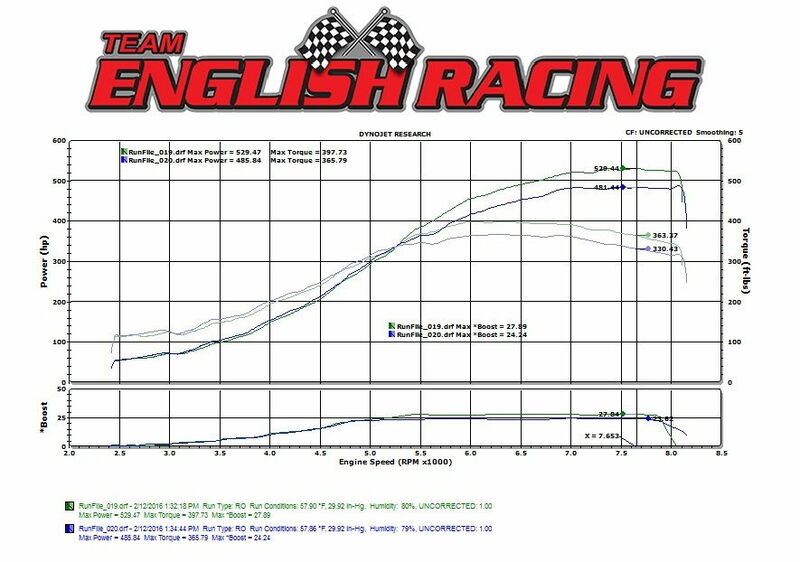 We tuned the car back to 26psi for final numbers holding at 493whp/375tq.